Customer Claims There Was Human Blood In Her Taco Bell Order. Are you ready to make that “Run for the border?” Well, not so fast! 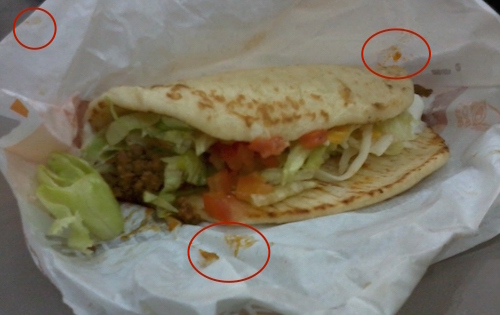 A customer of a Louisville KFC/Taco Bell is claiming that smears of human blood were all over her order. Breanna Ralston says she and her one-year-old daughter were already home, and had already eaten part of their dinner by the time she discovered what looked like human blood on the bag and wrappers – even where the wrappers came in contact with the food. Rolston called the Taco Bell to complain, and was told that the blood came from an employee who had “cut her finger.” Ralston contacted a lawyer and the health department. Taco Bell is sure having a rough year. In case you’d like to avoid eating there, the restaurant is on Third Street in Louisville, Kentucky. School District Exposed: Don’t Eat That! You Won’t Believe What They Are Feeding Your Kids!